Would you like to enjoy an spa-like experience right from the comfort of your home? Then you should buy the best inflatable hot tub. 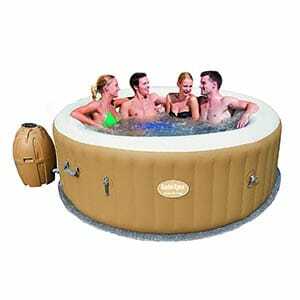 There is a wide range of inflatable hot tubs that come with different features and sizes. This is why I found it necessary to give you more details and the best options on the market so that you can choose the best tub to meet your needs. 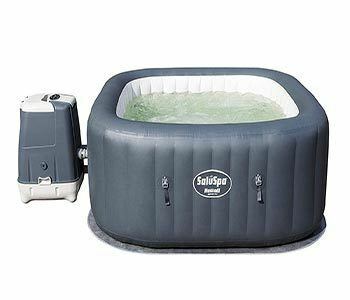 If you could ask for feedback from people already using these inflatable hot tubs, you will learn that the versatility and portability offer for incredible soaking experience. They make for amazing romantic night outs and incredible tailgate party as well. I would not think of a better place to bond while doing exactly nothing but enjoying a warm massage for partners. Why buy an inflatable hot tub while you can always run to your favorite spa salon? It all comes down to getting the same quality while saving lots of cash. These hot tubs will come at a price that will see you save as the years roll by. The secret to saving is investing in the best quality inflatable hot tubs. Well, the market is full of frauds, but there is always a clear line between the best and the rest. This post draws that line by giving you the top picks available today. 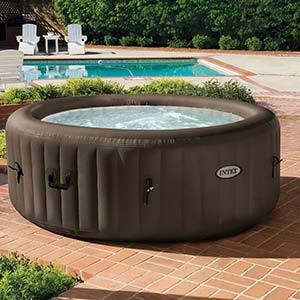 After testing different inflatable hot tubs from various brands by Inflatable Picks, the following are top recommendations to think of. The hot tubs are not only durable but also packed with great features to give you the fast experience. A feature so unique to the intex pure spa-6-person is the air pre-heating feature. This feature enables for effective heating by not slowing the heating process through the introduction of cold air. In less than 20 minutes the Intex Pure Spa will be ready for water thanks to the included pump. To facilitate for transportation and storage, the spa deflates in a matter of minutes. It has an incredible capacity of up to 6 persons, which makes it an awesome spa to use for a party. The manufacturer installs an easy to use control panel conveniently to allow you easy access to the controls. It allows for control of both the water temperatures and also the activation of the bubble jets. This spa has 170 high powered bubble jets that ensure for gentle massage. The manufacturer enhances comfort by the use of an inflated headrest that allows you to sit back and relax and you enjoy the heat and massage feature. Maintenance of this hot tub involves the easy replacement of the two filter cartridges that need no skills to replace. These cartridges ensure the delivery of refreshing water into the tub. The other part of maintenance would be to maintain proper pH levels that are quite easy to do with this intex spa. It has an inbuilt hard water treatment system that sees to it you do not have to deal with consequences of hard water that include itching skin. 48 fiber tech beams give for strong walls that allow for partial Deeping of your feet while sitting on the walls. The 48 fiber tech beam also makes for durability. It also comes with an LED light that makes the whole spa experience much fun. 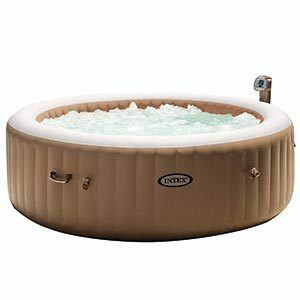 If you are looking for a best 4 person hot tubs, then you have one in the name of the Intex Pure Spa 4 person. It has a three-layer reinforced body. The multiple layers give a tough structure less prone to wear and tear. This body is what Lay-Z-Spa famously refers to as the Tri-tech construction, which gives far more than the additional strength, you can also bet on this construction to provide excellent insulation and comfort too. We have already seen that Tri-tech construction gives for enhanced comfort, but that alone is barely enough. It also has a luxurious heating feature that heats the water to 40 0 C. featuring a digital control panel, the manufacturer allows you for easy operation of the spa. The digital control system also allows you to set up the heating schedule, which enables you to harmonize it with your work schedule. No matter the season, this portable inflatable hot tub allows you to experience an incredible massage through the 120 air jets. The air jets are installed all-round the tub making for an even cloud of bubbles, meaning that everyone that is in the tub gets to experience the air jets massage. All reviewers agree that the air jets gives for a rejuvenating experience. It has excellent capacities both by volume and number of persons that it can accommodate. It accommodates 4-6 persons and has higher walls that make for more volume with regard to other Lay-Z-Spas. A luxurious leather look is one of the trademarks of the Lay-Z-Spa that blends in well with multiple environs including the garden. The installation process is always an issue for sub-standard inflatable hot-tubs and requires professional installation. Well, not the Palm Springs as it comes with an instructional DVD that makes installation quick and also easy. All you need is a flat surface, the instructional DVD, and a power outlet, and you will be up and running in 20 minutes at the most. 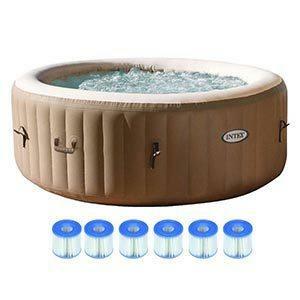 Are you looking for Best inflatable hot tub for winter? 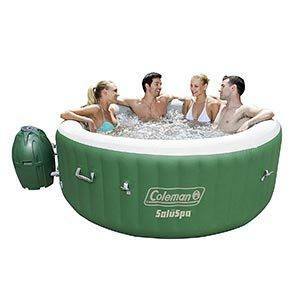 I think you should try Coleman SaluSpa Portable Hot Tub. It has never been easier to unwind in the comfort of your home than when using the elegant Coleman Saluspa. The exterior is black suitable for making contact with multiple setup places while the interior is white allowing for keeping highest levels of hygiene. I beam construction gives the spa excellent structural strength, that allows you to sit on the sides. The manufacturer also ensures the durability of the walls by using 3-ply PVC, while finishing the exterior with fabric materials to give for excellent aesthetics. The Coleman can accommodate up to 4 persons and has an equivalent high water capacity. Setting up the tub is quite easy ensuring that it does not derail your quest for some fun or soothing sore muscles. While you can lounge at home, its portability, which is facilitated by handles built on the sides sees to it that you can carry the tub with you to vacations. It reaches 104 0 Fahrenheit quickly and combines with the 60 surrounding air jets to give for an awesome soothing effect. To keep your tub clean the manufacturer provides you with a chemical floater plus a twin pack of cartridges that help with keeping debris off the pump and the tub as well. The inflatable cover keeps in the heat while keeping off any foreign materials. To make for comfort the manufacturer heavily pads the bottom of the tub. The pump allows for digital control that encompasses a soft touch control panel and also allows for temperature adjustments. The control panel is reachable from the tub hence making for the easy use of the hot tub. All of the tubs mentioned in this article represent superior quality, but the main issues from reviewers seem to be leaks, a condition that culminates from failure to pre-test the hot tub. As for Coleman, they do not leave anything to chance and conduct pre-tests on both the material and the tub for this Coleman. Tri-tech inflated walls make a tough exterior that ensures for optimal durability and a soft interior that gives incredible comfort. The rapid heating system does a remarkable job in soothing sore muscles after a long day at work. The soft touch control panel allows for digital control of the Lay-Z-massage system, the rapid heating system, and the water filtration systems, all at the touch of a button. To add to the control ability, the digital system allows for smart operation through the timer. It allows you to schedule the heating in harmony with the time that you will be using the tub. For example, you can set the timer to start heating the water in advance to reach the right temperatures at the time you will be getting home from work. During setup, the provided DVD comes very much in handy in helping with the instructions. The DVD also provides maintenance instructions. The high 6 person capacity allows you to enjoy the tub together with family or friends. The manufacturer provides for two filters after which you will need to purchase replacement filters to keep the tub in tiptop condition. The jets are strong enough to provide for a satisfying massage that will help you relax. Additionally, the manufacturer provides a chemical floater that helps with disinfecting the tub and a cover to maintain the water temperatures. The Saluspa Hawaii is an inflatable hot tub that you will not regret investing. It is worth noting that it can accommodate up to 6 people thanks to its awesome 210 gallons capacity. The advanced massage system uses eight hydro jets, which are adjustable, and bubble jets to give for excellent massaging. Setting up doesn't need any tool in exclusion of the spa pump that you need to inflate. The tub is usually ready for water in less than an hour. This tub has an inbuilt salt water and hard water treatment system that works for your good and good of the tub. The salt water system ensures the tub does not get smelly, while the hard water system ensures that water is gentle on your skin. An exceptionally built control panel allows for automatic start and stops where you set the temperature that you require and activate the system. The exterior of the Lay-Z-Spa Hawaii is puncture resistant thanks to the Tri-tech material that consists of three plies of reinforcement. The three-ply consists of polyester mesh between two PVC layers that ensure for enhanced strength and durability. The water rapidly heats to the required 104 o F temperature by utilizing a standard 110-120V power source and absorbing 12A of current. The floor is cushioned to ensure optimal comfort. Also, the floor has a drain valve conveniently placed for easy drainage. For easy lifting, the manufacturer builds in two lift handles that enhance portability. The leatheroid cover is notably better than for most of the other inflatable tubs. It comprises of double safety clips that keep the tub securely covered and has a built-in chamber that insulates the tub for temperature maintenance. Additional accessories that the manufacturer provides include the maintenance and setup DVD, a filter cartridge that ensures for debris free water, a pressure gauge that aids in keeping track of the tubs pressure to avoid under or over inflation, and a chemical floater. Fiber tech construction provides for superior quality in that the walls do not cave in when you sit on them, unlike conventional inflatable hot tubs that cave into your weight. The walls still provide for comfort. An exception also is its large capacity. It can hold up to 290 gallons of water seeing to it that it accommodates six people comfortably. It has a total of 140 high powered bubble jets that give for an excellent spa experience through the refreshing massage. It has easy to access and use control panel that allows for activation of the bubble jets. Also, the control panel allows for the adjustment of the temperature to the most suitable level. Featuring also is an inbuilt hard water treatment system softens hard water. Hard water could have degrading effects to the interior of the tub and also result in itchy skin. To ensure for refreshing spa water the manufacturer incorporates two easy to replace filter cartridges. Fiber tech construction puncture resistant and has additional laminated material to ensure that extended durability. A great quality of the fiber tech material is that it does not stretch with time so the tub keeps its shape. The manufacturer provides for an insulated cover that prevents heat loss and has a lock that facilitates for enhanced security of your hot tub. Also, it has an insulated ground cloth that works with the cover to further enhance the heat retention capability of this hot tub. Handles come to the aid whenever you want to transport the hot tub. The manufacturer further goes ahead to provide you with a carry bag. An accessory that facilitates for easy hygiene maintenance is the floating chlorine dispenser working in hand with the three-way test strips for proper pH maintenance. Bubbling during heating is a common problem as it is a cause for a decline in temperatures, a problem that the Intex Pure Spa 4-Person overcomes by heating the air before bubbling. Is it easy to set up like the rest of the best? The answer is yes and it also only requires the pump to be ready it for filling, deflation is even much easier facilitating for easy transport. Maintenance is also relatively easier as it involves mostly only the replacement of the two easy to replace filter cartridges. The biggest worry for people who want to take the spa experience at home is the electricity bills. Efficient water heating of this hot tub ensures for economic consumption of electricity. The four high powered jets and the heated water would not provide for a completely soothing experience with hard water. It is therefore in the best of the soothing experience that the manufacturer incorporates a saltwater sanitation combo. An advantage of the high powered jets is that you can effectively target specific areas of your body. To see that this hot tub does not crumble anytime soon, the manufacturer 48 fiber tech beams. Well, if you haven't heard about fiber tech beams, here it from me now, these beams have got exceptional strength and at the same time are lightweight thus making for the best inflatable tubs construction material. Digital control makes for a smart inflatable hot tub. You get the freedom to set the water temperatures anywhere between the range of 68-104 o F. it has perfect insulation at the bottom and the cover making for excellent heat sealing. The smart digital system will alert you when water gets out of balance via distinctive codes that you can tell from the manual. It doesn't have seats, which you do not need as the floor offers for incredible comfort. It is one of the few pumps that include both a manual and an electric pump, and it runs smoothly keeping noise to a minimum. A three set of twin pack filter cartridges makes for a total of 6 filters, which tells a lot about the integrated filtration system. It is a high-quality system that ensures no debris gets in the tub or stand destroying the pump for that matter. These cartridges are more of universal cartridges that are compatible with a range of other tub brands. Still, on keeping the hot tub clean, the manufacturer will provide you with a chemical floater to disinfect the tub. A rapid heating system sees to it that you the tub hit the sore muscles soothing temperature of 104 F fast. At your disposal, there will be a digital temperature control panel that ensures for easy control while in the tub. As you enjoy the comfort of the cushioned floor you will not need to leave your comfort to reset the temperature, all you have to do is reach out for the digital control, and you are good to keep on enjoying a blissful massage. 120 air jets are evenly distributed all-round the tub to create turbulence that gives for excellent massaging effect. Three-ply PVC offers for incredible durability and couples with I beam construction to see to it that you can afford to tailgate on the walls. 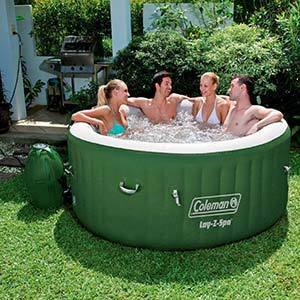 After deflating all of these inflatable hot tubs are incredibly portable, but the Coleman 71" x 26" Inflatable Spa 4-Person goes the extra mile of incorporating side handles that enhances the portability. Whenever that you are not using the tub the inflated cover comes in handy for extra security, and also for heat retention. The best way to show consideration for the customer is the manufacturer providing you with the accessories that you need for the first use of your new investment. These include an inflatable cover that offers top insulation for the hot tub, a chemical floater that maintains the tub`s hygiene, a filter cartridge to avoid clogging and destruction of the water pump, and an instructional DVD that guides you on set up and maintenance. This tub features I beam construction that has excellent properties. The construction makes for strong walls that extend the durability and resistance to punctures of the Lay-Z-Spa Miami. It also makes the spa essentially resistant to bending and buckling, which make this tub an excellent quality spa. Puncture resistant is further enhanced by Tri-tech material. The material contains three plies made of a polyester mesh core and layers of laminated PVC on either side of the core. Relaxation enhancement features include the fast heating feature and the Lay-z- massage. The heating system gets the water ready quickly and safely, which implies that the tub can heat the water as you soak in the tub. A digital control panel facilitates for ease of use of the tub, through it you can control the temperature, the massage system that features 120 bubble jets, and the filtration system. While in the temperature mode you can toggle between the Fahrenheit and the degree Celsius modes. You do not require tools to assemble the spa, and the manual and the DVD guide you on how to set up and maintain the spa. Maintenance involves keeping the right pH, a subject that the manual guides you on how to do it. An automatic start and stop timer give you the capability to schedule the heating. The tub accommodates four persons comfortably; a property facilitated by the excellent 177-gallon water capacity and inflated size. 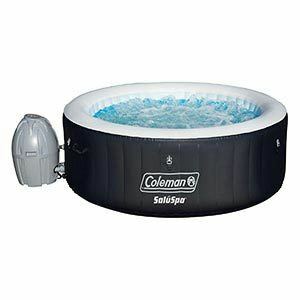 The maximum heat capacity is 104 0 F.
If you looking for the best portable hot tubs then why don't you try Coleman Lay-Z-Spa portable Hot Tub. ​Coleman Lay-Z Spa features a rapid heating system unique to this system, which gets you a spa experience in relatively less time. The heating system liaises with the bubble mode to create for excellent hot massage. It uses air jets to create for this Lay-Z massage system. Being an inflatable this hot tub is fully portable, which gives it excellent versatility, and you can never run out of choice on places to set it up. Over time some inflatable hot tubs lose shape through stretching. Contrary to these other tubs the manufacturer utilizes innovative beam technology, which offers excellent durability that translates to longevity in use hence value for money. The fact that it will also call for little to no maintenance contributes to the value for money. The manufacturer includes type VI cartridge filters that ensure for the health of the pump. Owing to its small volume of water the tub requires precise control of the pH levels, the manufacturer thus provides for a chlorine chemical floater. A setup and maintenance DVD makes for easy setup. During setup, the only tool that you need is the spa`s pump to inflate the unit. The DVD helps you familiarize with the possible maintenance's and their error codes, which prevent you from wasting time troubleshooting the possible problem. The massage jets and rapid heating system all sound fancy, but not without the digital control panel that allows you to control these parameters without setting foot out of the tub. To enhance the Spa experience is a cushioned floor that also incorporates the drain valve, which is conveniently positioned to offer for efficient drainage and still not get in your way. Owing to the time that it takes to reach optimal temperature, a temperature maintenance feature is an excellent addition, and that comes in the name of the cover, which provides excellent insulation. The cover also does an incredible job in keeping off kids and pets. The variety of hot tubs makes for the need to have some expectations beforehand. Otherwise, the retailers may end up swindling you. There are two types of capacity to consider. Water capacity and the persons` capacity, most often than not, the two correlate. Your choice of the best capacity will depend on the demand. 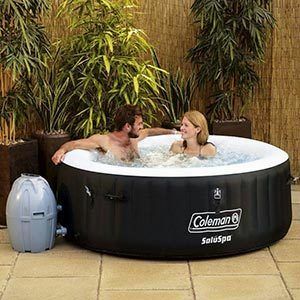 If the tub is for use by two persons, for example, the most suitable hot tub should have a capacity of two persons. A higher capacity might cost you more while you do not need it. If the purpose is for use for tailgate parties, then a higher capacity is desirable. When choosing the capacity, you ought to be aware of the implications. A low capacity translates into a lower running cost in comparison to a higher capacity. This cost will be in regards to the cost of chemicals and power needed to heat and maintain the water temperatures. Capacity relates to size, which also determines the space that the tub will occupy. Jet types vary between bubble jet and hydrotherapy jet. While bubble jets are sufficient to give a more than satisfactory spa experience, hydrotherapy jets may be the real deal for people who want more as you get the capability to focus the jets to specific parts of the body. These hydrotherapy jets do not come without the consequence of having to pay more than for the bubble jet. Covers are essential elements of the hot tubs that ensure for heat retention and protection. You protect your child from drowning by covering the tub making it childproof. The covers should be from high-density foam to ensure for optimal insulation. To enhance heat retention, it is important that the manufacturer ensures for good base insulation too. The construction encompasses the materials and the design. Most manufacturers will use multiple layer PVC or vinyl materials. I beam reinforcements make for sturdy inflatable hot tubs, which can afford use for tailgate parties. For the inflation, the manufacturers use segmented designs. You could find more stability by resorting to hot tubs that have interlocking panels. The rigid wall of interlocking panels provides excellent insulation. Also, on the list of quality inflatable hot tub material is a fiber tech material that has excellent strength and is lightweight. To kick-start your inflatable hot tub experience, the manufacturer should provide you with the basic accessories. These include the necessary filter cartridges and chemical dispensers. Having to fill the hot tub every time is exhausting, which means water might stand for several days hence the need for chemicals such as chlorine. Other accessories that enhance the hot tub experience are seat cushions, and cup holders' attachments. 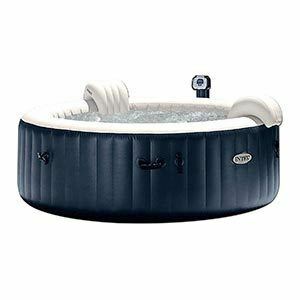 They enhance comfort and add luxury to the inflatable hot tubs. To enhance the durability of the tub, being made from inflatables prone to punctures, the manufacturer should also provide ground mats that protect the bottom from wear. One of the objectives of creating inflatable hot tubs was to give for portability. 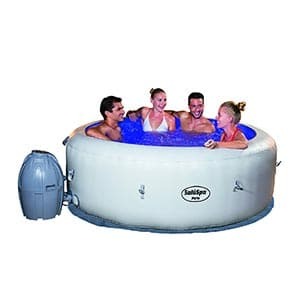 The design of the best inflatable hot tubs should make for enhanced portability, which is given by the ease of setup and inflate and deflate when the need to move arise. Providing for a carry bag would be a good addition to giving for portability. Handles built into the sides also give for easy carry of the hot tubs. There’s nothing better than taking a hot water bath right after a long and tiring day. And this can be done better when you’re doing it on an inflatable hot tub. Records from the ancient times suggested that soaking in a warm hot tub is not only relaxing but therapeutic as well. Joint inflammation is a common condition that affects 1 out of 6 people in the US alone. This condition often leads to pain and swelling in the joints which, when left unattended, can lead to loss of mobility. Most health professionals recommend treatments like massage and heat therapy to alleviate the pain. Alternatively, one of the most effective methods is by taking a regular daily session in a hot tub. According to experts, immersing yourself in a bathtub provides you the massage, warmth, and buoyancy you need to alleviate the pain brought by arthritis and joint inflammation. According to them, the water’s buoyancy can lessen the stress on the joint and allows free movement. Also, water movement can even act as a resistance to help you build your muscle strength. By immersing in a hot tub, your body temperature will go up, while the weightlessness you experience due to the water’s buoyancy will help you relax deeply, allowing you to enjoy a deeper sleep. This might come as a surprise, but using a hot tub therapy on your inflatable hot tub at least 30 minutes every day can actually help lower your blood sugar. However, you have to keep in mind that the results won’t be immediate after exiting the tub. With that in mind, I suggest you consult your physician first before you use a hot tub for a therapy in order to enjoy and obtain the full benefits it can bring. The best thing about using an inflatable hot tub is that you can store it quickly and easily within a few minutes. However, like its permanent counterparts, an inflatable hot tub will still require regular maintenance to allow it to last longer and provide you with a more relaxing session. Make sure you test the alkalinity and pH of the hot tub water and adjust them accordingly. Ideally, you want to keep the pH level between 7.4 to 7.6 since a lower pH can damage the material of the tub. It’s ideal to do use once every week. Use a sanitizing lotion before you use the tub, or at least once a week if not in use. Remove and clean your hot tub’s filter once a week. The placement of your hot tub’s filter may vary depending on the brand. In most cases, it’s located alongside its heating unit or outside the tub. If there are dirt or debris on the filter, make sure you remove them immediately. Keep in mind that the filter of an inflatable hot tub clogs up quickly and easily compared to their permanent counterparts. Owing to the quality of the materials that all of the above listed hot tub manufacturers' use, I can guarantee you for quality hot tubs that are worth investing your money. Take control and inject convenience in your schedule. You do not have to hurriedly pass through your favorite parlor and then walk/drive home later. With the inflatable hot tub setup at a place of your convenience, you can soak at any time you wish. I soak after work right before I get to bed. Since I got my inflatable hot tub, I have been having the best sleep and the most reproductive days of my lifetime. The manufacturers of these inflatable hot tubs represent the best brands in the market. You can only find a reason not to buy one of these bouquets of awesomeness, but it will be in vain. 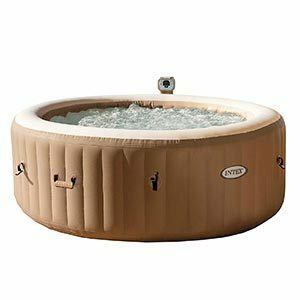 Customizable spa experience, easy to use, and durable these qualities make for the best inflatable hot tub, and you will be finding them in any of the above-listed tubs worth buying. I hope this inflatable hot tub reviews offered enough insight to choose a perfect hot tub.